For poppy lovers, having these beautiful flowers gracing your garden all year round is an absolute pleasure. 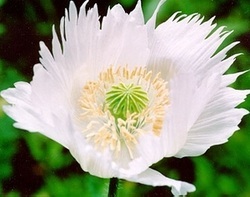 With a range of fantastic blooms, Papaver somniferum plants are brilliant for use in any garden, whatever the design. Single, crisp petals are perfect for utilizing in a modern and chic garden, while doubled petaled and frilled flowers are ideal for those who want to create some drama to their garden. However, Papaver somniferum poppies, also known as Breadseed poppies, are annual in nature and so if you want to have new plants the following year, it is a good idea to collect and store the poppy seeds. While you may deadhead throughout the gardening year to encourage these plants to keep producing flowers, it is important that you leave some buds on the stems as the season starts to wind down. This will allow the plant to create swollen pods full of poppy seeds which are perfect for collecting. Nature can easily be left to its own devices, and after the petals have dropped and the pod has ripened, the breeze will quickly spread seeds in the vicinity of the parent plant. This is fine if you don’t mind seedlings growing where they landed, but if you want to plan out your poppy planting, or use the poppy seeds in the kitchen, it is important to collect and store them correctly. Collecting Papaver somniferum seeds is very easy to do. It is best to have some form of container ready such as a paper envelope or container in which to catch the seeds. Breadseed poppies have beautiful seed heads which you may like to leave in the garden as an architectural delight, a fantastic attraction especially during the winter when frost and snow clings to them. Alternatively, as these plants are also known as the Florist Poppy, the seed heads can be kept and used in flower arrangements. Holding the envelope or bag underneath the seed head, shake gently so that the hundreds of seeds are scattered from the poppy into your container. If you don’t want to leave the seed head in place you can also cut it carefully so you don’t lose the poppy seed, and place the entire pod into your container. Once you have your poppy seeds safely secured it is important to keep them safe, whatever you plan for them. You must first ensure that your poppy seeds are dried out. This prevents mold growth and ensures that they can be stored for years. Keep them out of the light in container and put them in a warm, dry place with good air circulation. Approximately two weeks after collecting your seeds should be dried and can be placed in an airtight container, labeled with the plant species and date, and placed in a cool, dry place. Poppy seeds, if correctly stored, can remain viable for many years, offering the promise of germination and beautiful new flowers for upcoming seasons. Meanwhile, with their fantastic use in the kitchen, poppy seeds can add great flavors to a range of foods including breads, soups, and chicken. And by taking a few moments to collect and store your poppy seeds you can ensure that you get the best from your poppies.